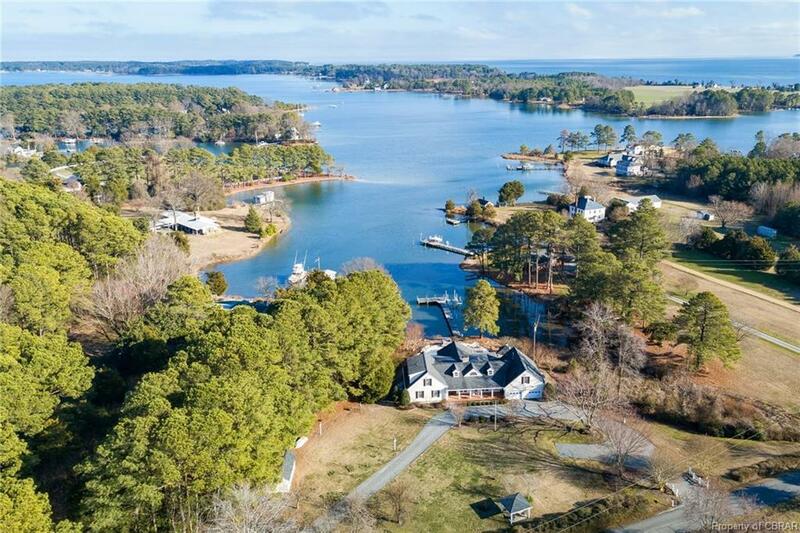 This sophisticated coastal home is sited on a private 1.5 acres off a quiet road near White Stone. Totally renovated, it has a virtually maintenance-free exterior, handsome entry, and waterside brick veranda. Accented by sturdy white columns, this home extends a gracious Southern welcome. The bright formal dining-living room has French doors lining the outer wall. The striking great room has spectacular views of this classic Bay setting. Fine details: hardwood floors, stone fireplace, 5-piece crown molding, walls of glass and white custom cabinetry, convey an understated elegance. A cozy fireplace sitting area opens to the light-washed great room with vaulted ceiling and glass doors. The doors lead to the veranda & terrace, encircling the waterside pool, and a large screen porch with brick floor and beadboard ceiling. A dining area is framed by the raised kitchen counter with glass cabinets and wall of windows with water views. The polished kitchen with lighted cabinetry with desk, granite counters & center island is a great place to gather. The laundry/mudroom leads to a 2-bay garage & full bath with pool access. A dock with boat lift on protected water provides an ideal harbor. Directions: From White Stone, Take Va-3/Mary Ball Road Towards Kilmarnock, Turn Right Onto Ocran Road, Take First Right Onto Scott Road. Scott Road Becomes Little Bay Road. Property Is On Left.